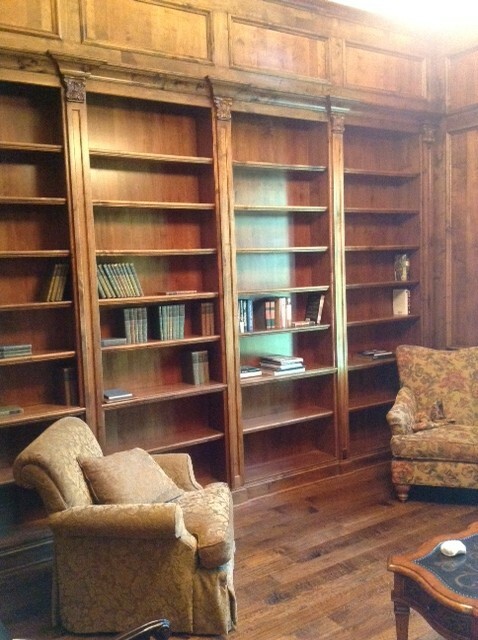 So often clients send out a “911” when it comes to accessorizing bookshelves. It can be tricky ~ figuring out what to put in them and such. 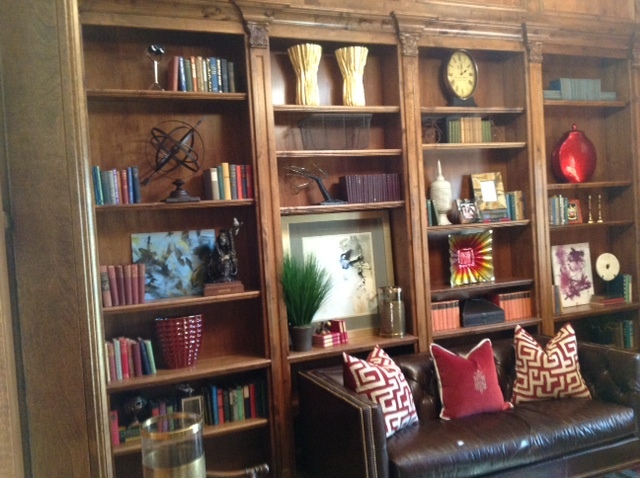 Here are some things that I try to incorporate when I’m decorating bookshelves. This is a monster! 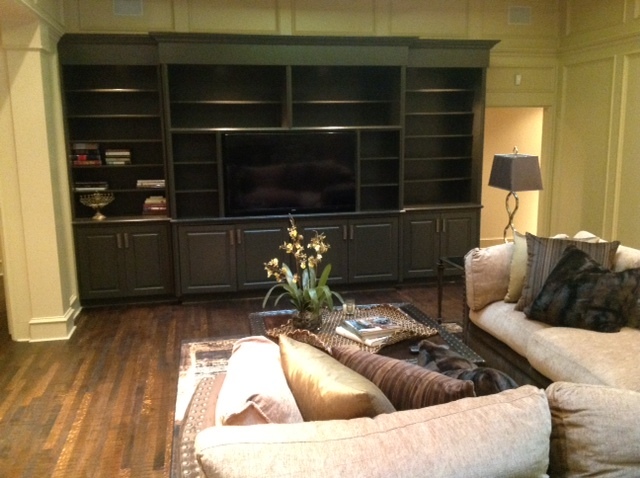 A big dark empty wall unit. First of all, don’t keep all of the shelves the same height. I think mixing it up makes it more interesting, so adjust them for varying interest. You can see in the second picture how many I removed from my client’s wall unit. Play with the scale of your accessories. To avoid monotony, make sure you choose items of different sizes. Create an opening large enough for artwork or a sculpture. Place your larger items in the shelves, not all together, maybe one in the middle left, another on the top right and then fill in the other spaces. 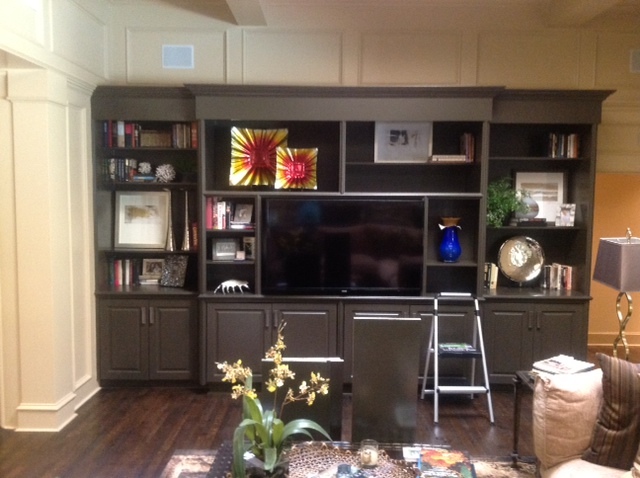 You’ll notice that I also incorporated some colorful things into this client’s wall unit to make it come alive. In the smaller openings use a great box or group of books. I also wanted to make it personal. Showcase something that was brought back from your trip to Venice or found on a beach. 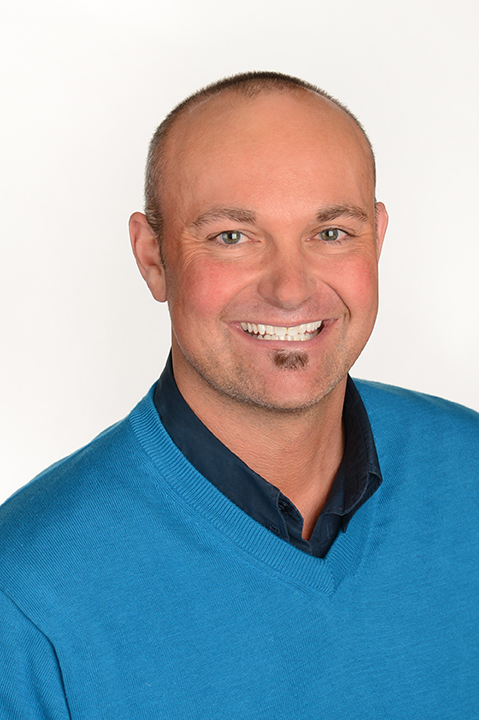 Using items that have meaning to you will also help tell your story and reflect your life in your home’s design. I also love family photos mixed in, with some great new picture frames you found at IBB Design Fine Furnishings. Be unconventional, if you have grandma’s china or a great collection of silver, use this has a springboard for your display design. Things look better grouped in a collection, rather than spread out. It makes more of an impact. Place your larger items in the shelves, not all together, maybe one in the middle left, another on the top right and then fill in the other spaces. You can also choose a color pallet and keep it say Turquoise, Yellow and Green. Then when you’re out shopping you know what you need to buy and what to look out for. This is a great look for a more transitional space. I hope that a few of these tips and tricks will help with your bookshelf design and remember IBB Design Fine Furnishings has gorgeous accessories to help with the process.